Good morning! I was filling out some information for my blog the other day, and needed to write something in for January 2016. It was then that it dawned on me that 2015 was almost over! Which also means that it’s time for a brand new blog planner! 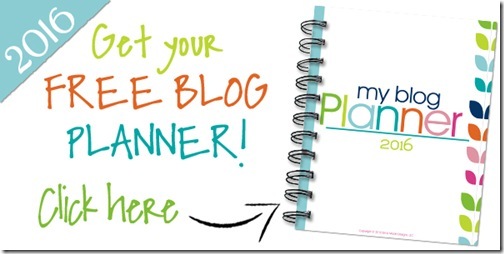 So for all of you bloggers out there, my new 2016 Blog Planner is now available! YAY! So if you’re ready to get going for the new year, keep reading! As you can see above I went with the calendar layout for this planner and added some extra info on the opposing page. It includes Monthly Statistics, websites and inspiration, post ideas and notes, tweets, pinterest pins, and additional notes. After downloading, I print the planner double-sided by printing the odd pages starting with page 1. Then flip the pages and print the even pages on the backs. I print on a light weight cardstock (meaning the cheapest one I could find), just to give the planner a little more durability. It also keeps the ink from bleeding through when writing on both sides. 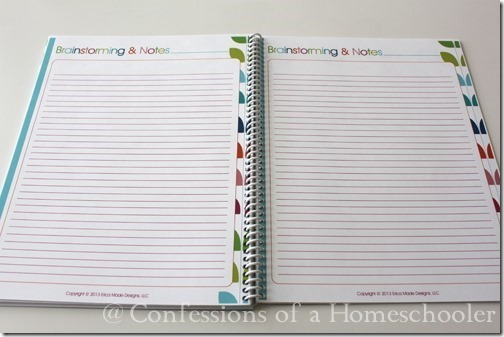 Next take the printed sheets to your Office Supply store and have them spiral bind it. I spent about $3.50 for the coil and a clear front cover and white back cover for my planner. This just makes it more durable and holds it together beautifully! Each month has statistic sheets as well as a monthly view layout where you can list all of your blog posts. 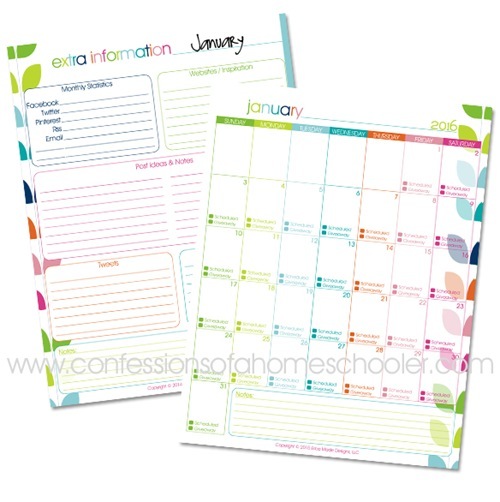 If you print double sided like I suggest, you’ll end up with your monthly calendar on one side and the notes and other information for that month on the opposing side. It also includes pages to help keep track of your sponsors, advertisers and affiliates. There is also a page to organize giveaways and. I also included a page to help keep track of all of your social media statistics, as well as planned social posts. 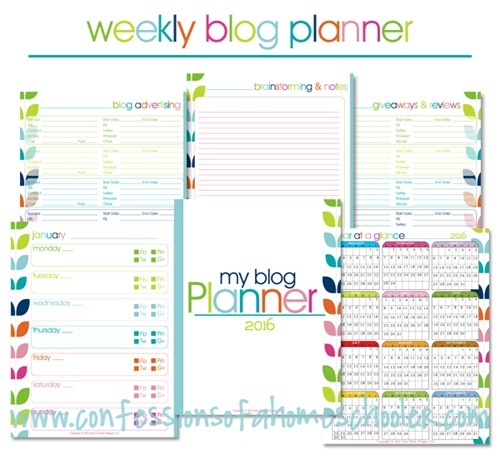 Click the image below to download your free 2016 Blog Planner now! 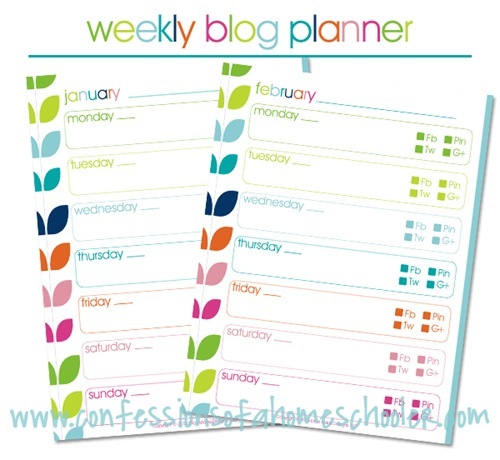 For those of you who prefer a weekly view, I also have a free 2016 weekly blog planner here. The pages aren’t dated, so you can write in the dates for each week. 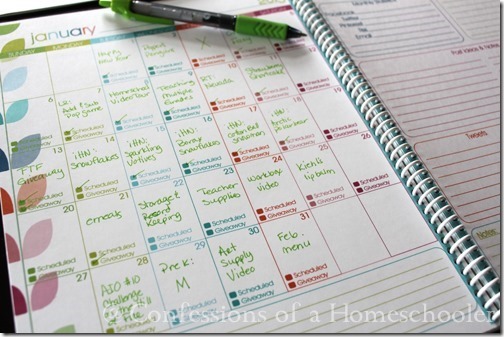 This planner gives you a weekly view instead of a monthly view. This one is also meant to be printed double sided, and on light weight cardstock for best results. It also includes the same handy pages for notes, advertising, giveaways, review, and monthly notes as my other planner as well. This is awesome! Definitely going to down load! Thanks for sharing! Thanks so much for sharing this! You are so generous! This is wonderful, as is everything you do! This is my favorite website to come to for all things homeschooling. Blogging information is just a bonus!! Thanks so much! This is awesome. Thank you so much for this. It’s beautiful. Additionally my husband and I are seriously considering homeschooling our two so I cant wait to dig into your blog some more. Have a great day! Thank you for giving this away for FREE again this year! It is such a blessing to me and my blogging buddies. We appreciate YOU! Thank you so much for this planner. As a newbie blogger, I can’t say how helpful this will be! Thanks so much. This is great! Gosh I know this was a lot of work to produce. I can’t say thank you enough for this and your other resources! I purchased your intro to homeschooling and the planner. We use it everyday. God bless!